You know the old saying, scratch my back and I'll scratch yours? It basically means that if you want a hand, you have to lend one first. That's exactly what Paul Ekas has set out to do with his company, Sake Robotics, which manufactures grippers for industrial robots. “As robots move into unstructured environments, and can start doing useful work, like clean the house someday, one of the big markets is just the ability to pick stuff up and put it down,” Ekas says. 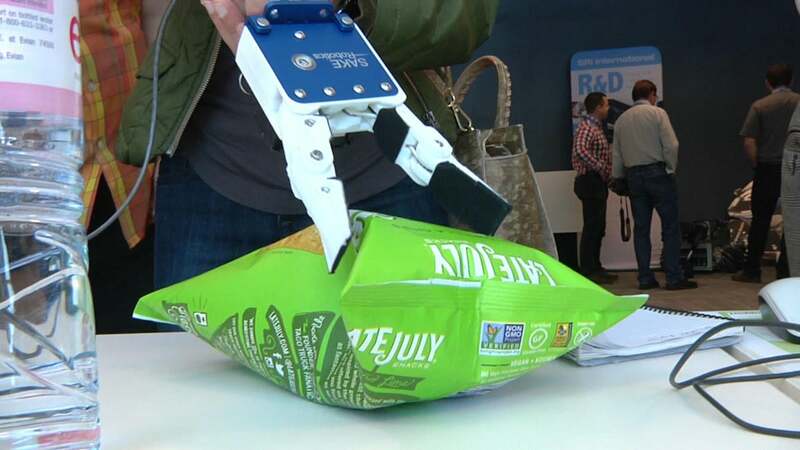 Sake Robotics has designed its gripper, called EZGripper, with versatility in mind. It comes with a universal mount so that it can be attached to a variety of robotic arms and can pick up objects as thin as a pen or as bulky as a volleyball. A single gripper runs about US$1,600 and takes about an hour to manufacture. Ekas says that Universal Robots, Kuka Robots, and Rethink Robotics are already using EZGrippers. The EZGrippers are also compatible with robots from other manufacturers, including Fetch Robotics and Barrett Robotics, according to Sake's website. "Companies like Amazon or any of the logistics companies right now are all looking at this technology. And then as you start going farther in time, you are gonna start seeing service robotics do stuff in food industry, or in hospitals, and then some day, they are gonna come into our house and do useful work," Ekas says. Big companies like Amazon have taken notice. In fact, two of Ekas' customers are competing in the online retailer's robotics challenge, which asks teams to build both the hardware and the software for picking and stowing items on shelves. Magdalena Petrova is a Video Correspondent covering daily tech news for IDG News Service and is based in San Francisco.